Contact John for Club hours and Current types of cars being raced. Photos provided by John Lacko - I will attempt to gather more information and photos as soon as I can. 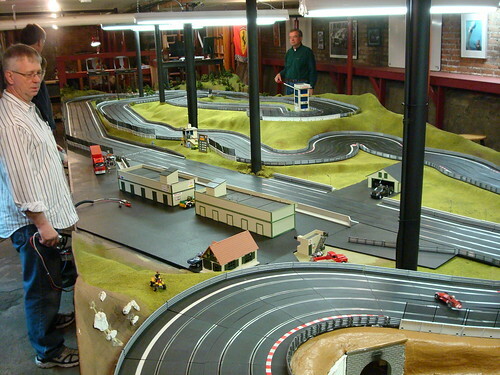 My friend Josh Willson and I decided to build the track in the basement of a downtown Kalamazoo building that he bought for a residence and for a retail store for his wife. We tried to make it as scale realistic as possible. Both Josh and I have busy schedules, so we have not been able to complete as much of it as we would have liked. The track is not a commercial venture and so not open to the public. The track is named after Leland F. Goodspeed, who set six speed records over distances from one kilometer to five miles by driving 104.36 mph in a Roamer at Daytona Beach in 1921. He was also the VP of Engineering at Roamer, which was built here in Kalamazoo. Besides we like the name Goodwood and thought Goodspeed would be close enough and appropriate. We have plenty of trees already installed and plan for lots more. In fact, we will have so many trees along the track, we are going to have a special racing event each year to be called "The Goodspeed Festival of Wood." 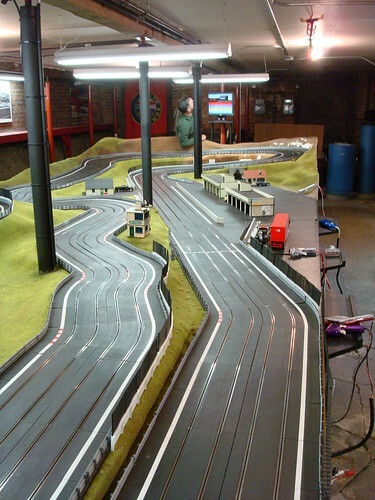 The track is Scalextric Sport. It is four lanes and about 118 feet in length. There is an elevation range of about a foot. The table is 32' long and 10' wide. We do not have a formal club. Instead, we have a group of about 20 guys who race RTR cars in 37 classes. We stress scale and accuracy. The classes are set up for 1/32 replicas of cars that actually raced against one another from 1950's GP to contemporary LMP. We allow very little modification and virtually no motor swaps. We have strict magnet "pull" limits on each class to restrict "downforce." Magnet Marshalls are used to enforce the limit during tech inspection before racing. Last edited by MG Brown; 12-05-2009, 01:00 PM. I'm in Kalamazoo 4 or 5 times a year visiting relatives. I would LOVE to see this sometime! I just got up on the GoodSpeed track in Kalamazoo. Haven't seen it yet and can't find anything on the race schedule. If anyone knows can you post a link or send a message please? This is an older Thread, but hopefully someone subscribed to it will be able to help. If you PM me, I'll email you contact info. Goodspeed is moving to the GILMORE CAR MUSEUM and will become the Red Barn Raceway. If you don't know the GILMORE CAR MUSEUM google it. 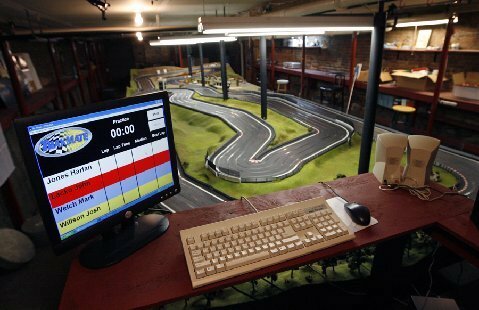 The building Goodspeed Raceway (slot car track) was in has been sold and is being renovated. This created a need for a new home. From my involvement we are rebuilding the track in a changed configuration at the Gilmore Car Museum. So far a new layout in an 8'6x29' platform has been designed and is in the construction stage. I don't have information for a firm date but estimate we will be working on the track for the through November 2017 and into December 2017 or so. The layout looks great and I have provided a 43" display to contribute to the race management software. I'll keep working with the guys there is complete the technical package and the race track itself. Hopefully there are others who will get involved. Please contact John Lacko via the contact information above for more details. I'm sure going to try making it over to GILMORE CAR MUSEUM in the near future it's not much of a drive for me, way better then driving to the zoo. Thank You for posting this thread I sure hope more guys in the area read this post. Hi, I see that you have an event on 3/18/2018! Very nice venue for the track, hope to meet you there.